This year's first issue of the Allandale Neighbor is out. The 24-page newsletter includes a great mix of articles on the neighborhood association's activities, Gullett, crime stats, neighborhood safety, a new restaurant, sidewalks, and more. The headline article is "Two Viewpoints on the Evolution of Burnet Rd," a thought-provoking presentation of two views on growth along this rapidly growing traffic corridor. Speaking of Burnet Rd, we can all agree that trying to cross Burnet Rd these days at any place other than at an intersection is becoming virtually impossible. That is the subject of the article, "Another traffic light on Burnet Rd being discussed," by Sam Shore. Sam lives on the east side of Burnet Rd. on Adams Ave, the street that intersects Burnet Rd. where the new Burnet Flats apartment development is going up. He and other Brentwood neighborhood representatives have been in discussion with the City about putting up a traffic light at that intersection. If you drive Burnet Rd (of course you do) you will be interested to know how that is proceeding. Allandale has joined in on the discussions. Beginning with this issue the newsletter is now being delivered to apartments and many of the businesses in the neighborhood in addition to the 3,100 homes in Allandale that have always received it. That brings our total distribution to over 4,800. We welcome our new readers. As always, thanks to everyone who helped with getting this issue out and thanks to our advertisers. 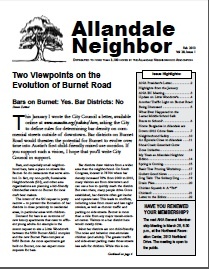 This is my last issue as editor of the Allandale Neighbor newsletter. I am not moving away. In fact, I hope to continue contributing articles to the publication, but after nearly eight years as editor, it is time for someone else to orchestrate the efforts. I have truly enjoyed working with all of the volunteers involved with it. Allandale has one of the more robust newsletters in Austin and I do not anticipate that will change.